I long ago burned out on Fantasy Football. I can’t wrap my little brain around the FanDuelDraftKings craze. And I’ve wasted lots of time and a little money on not finishing first in those Eliminator Pools. But, alas, like most fans, I do like to have a little extra interest in Cowboys games. So let’s do this: I just robbed an imaginary bank and pocketed a virtual $1,000. What better way to spend it than on some mythical wagering.I’ll start with my $1k bankroll and each week – usually on Friday – I’ll analyze the upcoming Cowboys game and make a wager. With any luck, by Christmas it’ll be iPhone upgrades for everyone. Do I think we’ll win? You betcha! The Cowboys are favored by six points against the Giants Sunday night in Arlington. Remember once upon a time when Eli Manning never lost in Arlington? In case you haven’t noticed, those days are long gone. Dallas comes into the opener 5-1 against the Giants in their last six meetings, including winning the last two at AT&T Stadium. One of those wins came in this exact situation in 2013, when the Cowboys won, 36-31, behind six turnovers in a Sunday-night opener. How close are the Cowboys to a six-game winning streak in the series? Dez Bryant’s pinky touching out of bounds in the end zone in 2012, that’s how close. There are a couple reasons to be worried about the Cowboys. I’m not convinced the committee of running backs (Joseph Randle, Darren McFadden and Lance Dunbar) will combine to produce one good running back. 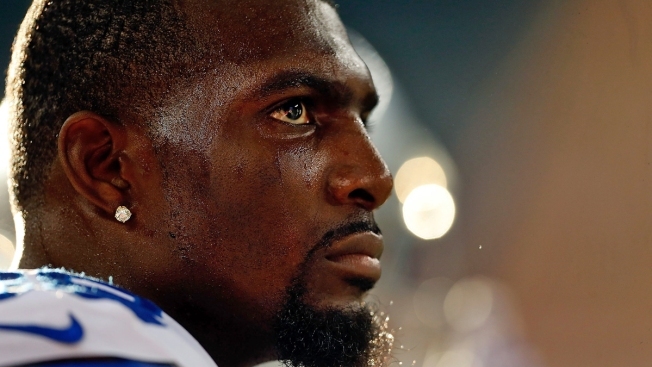 Dez Bryant hasn’t taken a snap all preseason. And on defense, Rolando McClain and Greg Hardy are both out due to league suspension, leaving a depleted secondary without best cover corner Orlando Scandrick to chase around Odell Beckham Jr. I don’t see the Cowboys going 12-4 again. Everything went right for them last year, including the healthy, record-setting season by DeMarco Murray. But I do see them going 1-0. Because the Giants are, well, just a mediocre squad that will be without two of its premiere play-makers in pass-rusher Jason Pierre-Paul and receiver Victor Cruz. And due to a season-ending injury to Will Beatty, they’ll also start a rookie – 9th overall draft pick Erek Flowers – at left tackle. Yikes. I realize it’s an NFC East rivalry game under the bright lights of Sunday Night Football on NBC. But, in reality, the Giants are perfect fodder here for a Cowboys’ blowout. ArtsyCraftsy Tony Romo's team 30, BadComedian Eli Manning's team 17.